We never posted it, but we have in the archives a shot of Emily, Whitey, and Billy all sharing the bedroom with reasonable space between them. 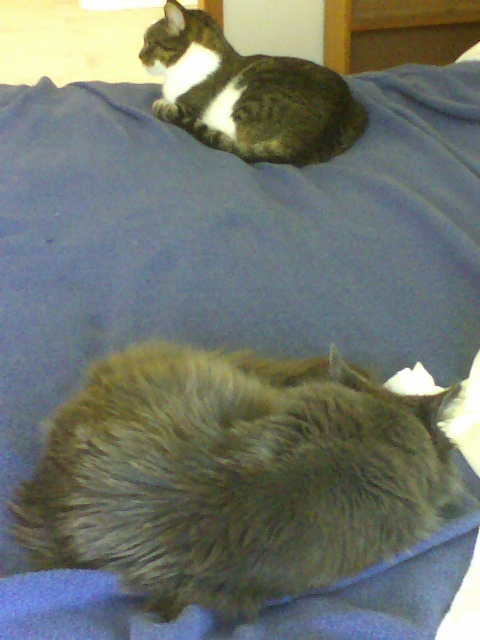 Likewise, at nap time the now departed The Gray Mouser (as Kageneko was known while here) and Billy could co-exist. Update: Actually, we had posted a picture of Emily co-existing with the boys as early as their first summer. Note that Emily was actually larger than the young Catzilla brothers, which no doubt helped her teach them proper respect.